Hervé Ladsous, UN Under-Secretary-General for Peacekeeping Operations, visited the Bentiu Field Office of the UN Mission in South Sudan (UNMISS), on 11 June. Mr. Ladsous was briefed by Field Office leadership on the security and humanitarian situations and toured Bentiu Protection of Civilians (POC) site as well as meeting with Bentiu POC site community leaders. Mr. Ladsous also paid a courtesy visit to the Acting Governor in Bentiu and met with senior government officials. 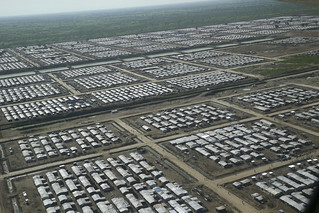 Aerial view of Bentiu Protection of Civilians (POC) site.